A really useful session with Kay. 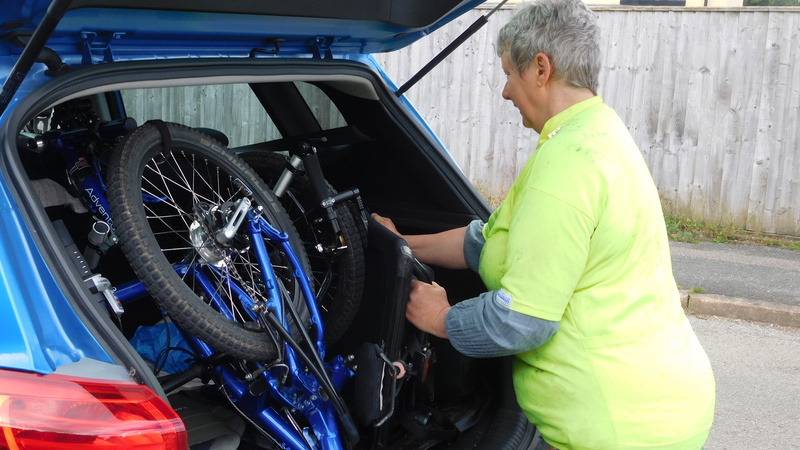 I enjoyed the very task specific exercises that covered the AT method for taking the folded recumbent trike out of the car, unfolding it and getting it ready to ride. My riding position, with specific reference to the headrest was also critiqued. It was then time to do the review and reverse the lessons learned. Preparing the trike for folding, lifting into the car, positioning it correctly in the car, and then packing bags of cycling gear around and underneath it! A fantastic one to one session. I’ve never really put any thought into how I manhandle my trike. Now I’m practising thinking stop, think about the stages/ movements involved, and doing the next stage, stopping, checking body position, before going forward to next stage, my 18 Kg trike felt lighter to move since Kay was ensuring that I was using body balance and tone, rather than strength for all these tricky manoeuvres!